Royal SableTek brushes are made using a proprietary blend of the finest quality synthetic filaments, nickel plated brass ferrules, double crimped to kiln dried hardwood handles with a silk-touch finish. 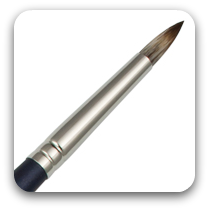 The result is more control and precision in executing brush strokes, added durability in maintaining points, and consistent edges. They allow the artist to lay down the maximum amount of color and follow through with longer strokes. These brushes may be used with any viscosity paint, but work best with acrylics or oils.